In addition to the field services offered by QMPS, veterinarians and dairy producers throughout the state may take advantage of the opportunity to submit clinical samples directly to the regional laboratories. The resulting culture information can be used to determine the source of infection, treatment and effectiveness of treatment. When mailing samples to QMPS, please make sure they are well refrigerated with ice packs and even freezing the samples prior to shipping is advised. New DOT regulations are now in effect. To help the sender with the proper mailing of samples, QMPS offers a return foam box fully outfitted with the required DOT mailing material. More information is located at the link below. Mail early in the week, avoiding Thursday or Friday as the samples may not reach our laboratories until the following week. Laboratory diagnostics are performed according to procedures outlined in the National Mastitis Council Laboratory Handbook on Bovine Mastitis. Field Service Cancellation Fee: This may be charged if on-farm services are not canceled by the end of the business day 48 hours prior to the scheduled service date. This excludes holidays and weekends. If paid at time of service, a 5% discount given to on-farm services. All referral tests will be charged a $10.50 fee, per submission. Individual samples are often sent by the dairy producers or veterinarians via Federal Express, UPS, or similar service. Care must be taken when sending these samples to ensure their safe arrival. There are new federal shipping regulation guidelines that must be followed for proper shipping of samples. Cold packs should be included - at all times of the year - to avoid inaccurate results. The sample vial should be sterile and well identified. (QMPS offers a Returnable Sample Submission Kit for producers.) A QMPS form or slip of paper must be included with name, complete addresses and telephone/fax numbers of both the dairy producer and veterinarian, cow identification and test(s) being requested. The key to obtaining accurate results begins with collection of the milk sample. Although sampling is quite simple and routinely practiced, the quality of samples varies greatly. Two general rules apply whether sampling an individual quarter or an entire herd. (1) Use clean aseptic technique, and (2) refrigerate samples immediately. Failure to follow these basic rules will likely cause inaccurate culture results. Samples may be collected post milking for best results. Be sure cows' teats are clean and dry. Contamination will often result if teats are wet, whether due to excessive water or alcohol. Cotton gauze moistened with alcohol should be used to clean the teat end. Scrub thoroughly until the cotton remains clean, cleaning the far teats first and the near teats last. To reduce contamination of the cleaned teats, sample in the reverse order. The first streams of milk should be discarded before collecting the sample. The collection vial should be sterile with a tightly fitting cap. If unavailable, use a sterile tube that seals tightly; samples which leak will generally become contaminated. The vial should be held at a 45° angle. One or two ml of milk per quarter is sufficient for culture. For composite samples, an equal amount of milk from each quarter is desired to assure accuracy in milk culture interpretation. 1. Label tubes with cow number and/or quarter. 2. Clean Teats: Brush loose dirt, bedding and hair from udder and teats with hand or individual dry paper towel. Grossly dirty teats and udders should be washed and dried thoroughly before sample collection. 3. Alcohol Scrub: Scrub teat ends vigorously with cotton moistened with alcohol. Do not saturate cotton with alcohol or use same piece of gauze on more than one teat. Swab furthest teats first, and sample those teats last. Teat ends should be visibly clean before taking sample. 4. Forestrip: Remove a stream of milk from each teat before taking a sample. (This helps rid the streak canal and teat cistern of high bacteria and high cell count milk.) Observe for clinical mastitis. 5. Collection: Be careful not to touch clean teat end. Hold bottle at 45 degree angle and open the cap. Please try to keep contaminates (manure, hair, etc) from falling in the cap or vial. For a quarter sample, use a separate vial for each teat. 6. 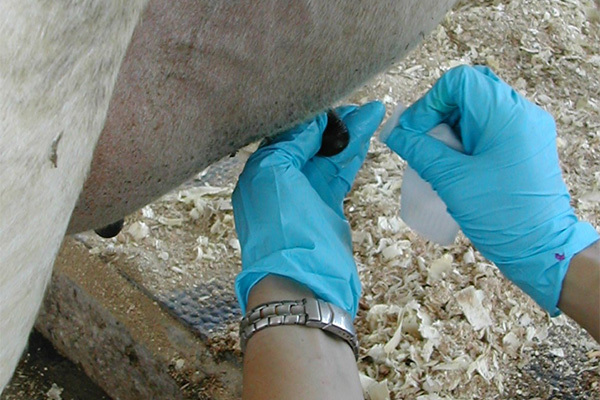 Teat Dip: If samples are taken between milkings or at the end of milking, teats should be post-dipped. Dip teats with an approved teat dip. 7. Storage: Store samples immediately on ice or refrigerate. 8. Bulk Tank Sampling: Agitate tank for at least five minutes. Use a sterile milk straw or clean, sterile dipper. Do not collect sample from the valve at the bottom of tank. Use a sterile vial and fill about three-fourths full. Refrigerate sample at once or freeze if sample will not be delivered in 24 hours. 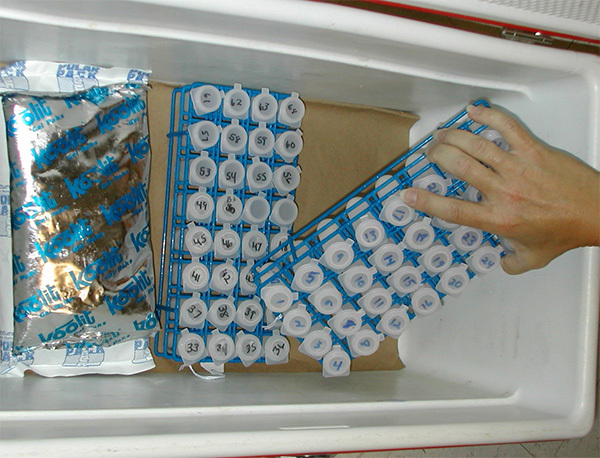 Milk samples should be placed on ice immediately for transport to the laboratory. If not chilled properly, a single contaminant organism can quickly overgrow and mask the real culture result. If samples are to be shipped or held for over 24 hours, they should be frozen (unless being tested for SCC) and thawed at the laboratory. Improper sample collection, transport, or storage can lead to inaccurate information concerning the cow or a herd problem.